Since our inception 2007, National Testing Laboratory Pvt. Ltd. is engaged in offering accurate and clear testing services. We have achieved a single position in the field of testing and analysis of materials through its constant effort and commitment of quality. We are spread in the area of 20,000 sq. feet with four storey building Delhi. Our professionals are dedicated to achieve the organizational goal. We follow the national as well as international standard during the testing and analysis. We are managed by team of experienced professionals who support in the field of testing equipment and instruments. They understand the needs of our esteemed client to acquire maximum customer satisfaction. All the products are inspected in our latest lab using high-tech technologies that guarantee for the quality finishes. 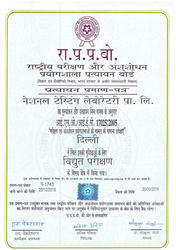 Certification of ISO and NABL and many more approvals help us to get the gratification of our clients. We are continuously attached with our clients to offer them various testing solutions for metals, buildings and many more. Our clients are based at all over the world as we are rapidly establishing our position in the national as well as international markets. 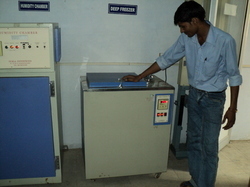 The Director Technical Mr.C.N.Mishra is the founder partner of the laboratory. He is a scientist of repute. He has an experience of over 18 years in the field of Testing & Quality Assurance in prestigious organizations. The Executive Director Mr.Swaraj Shukla is the founder partner of the laboratory. He has an experience of over 13 years in the field of Marketing in prestigious organizations. Our laboratories are quality driven organization for providing customized solutions to our diverse clients. 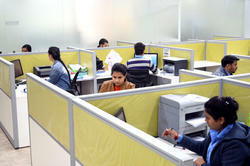 We comprise a state-of-the-art testing laboratory and it is well equipped with all innovative and latest technologies. Our quality controller team inspects each and every process of testing to ensure the flawless of the products. All the tests performed by our professionals are done to comply with the national as well as international standards. The following standards are followed to test the quality of the products. Our Laboratory is a centre of excellence in Testing Located at Plot No. 83/14, Street No. 1,Opp. Metro Pillar No. 557, Udyog Nagar, Mundka Industrial Area, New Delhi-110041. The state ofart infrastructue is spread over 4500 square feet area in the ground floor, 4500 in 1st floor, second &3rd & 4th floor, Approx. total area 20000 Sq. Ft., with facilities for matching global standards.The testing is performed by highly qualified & experienced technical personnel with international exposure.We provide very attractive business terms for the total satisfaction of the customers, through the servicesof our laboratory which is accredited as per ISO/IEC 17025:2005. Our organization is engaged in the testing of Chemical, Mechanical/Physical, Electrical and Biological attributes of various products. Our professionals have specific knowledge and experience in their domains and our organization has acquired the unique services of our professionals. The chemical composition of different types of products is tested by our team. We test the products such as metals, chemicals, rubber and polymers to name a few. Our dedicated team inspects the physical properties such as corrosion resistance, strength and composition of items. We test different types of electrical equipment such as PVC insulated wire & cable, switch and socket. We also inspect quality of Drinking water as well as construction purpose. As we are an emerging organization, we are driven by the experienced and skilled professionals. Our organization is offering the unmatched testing services to our clients that are used in various industries. We use favorable equipment to test various materials. These services are brought forth to our esteemed clients at the reasonable prices. We have a staff of dedicated and highly talented industry experts, who have vast understanding and knowledge of the testing processes. Their strong support allows us in successfully understanding and satisfying the diversified needs of our clients. They work with utmost dedication to present the extensive range of testing solutions. Our organization is intended to hire only such professionals who have vast knowledge and experience to guarantee the quality of our tests. Our skilled team uses only high-tech and advanced equipment to inspect the conduct complicated tests. The effort of our professionals is very much appreciated by our clients. Coarse / Fine Aggregate: - We offer entire testingas per IS: 383/1970, IS: 2386, CPWD, MORTH. Here we tests various properties of the products such as gravity, Bulk Density, Soundness, Alkali reactivity, Particle Size, Deleterious material Abrasion etc. TOR /TMT/ Structural Steel: - Our organization test tensile strength, Yield Strength, Elongation, Bend/ Rebind, & Chemical Analysis. These are tested according to the IS: 1786/1985, IS: 2062/1999 CPWD. Cement: - During the testing of cement, we check Compressive, Strength, Fineness, Setting Time, Soundness, Cao, Mgo, Al2O3, SiO2, SO3 LOI, Cl etc. These are done as per as IS: 8112 /1989, IS: 269, IS: 12269, IS: 455,IS: 1489(P-1 & 2). Brick/ Brick Tiles: - Using IS: 1077, 12894, 13757, we test the brick and brick tiles. CPWD Specification:-Here we test compressive strength, water absorption, Dimension, Efflorescence and many more properties. Ceramic Tiles (glazed / unglazed): This testing is performed as per as exact specification of IS: 15622, IS: 4457. Cement Concrete Tile (Chequered / Terrazzo / Mosaic):- We test water absorption, resistance to wear and dimension thick of Wearing Layer. This testing is done as per as IS: 1237, IS: 13801. Paver Block:- Our professional test various attributes such as compressive strength, water absorption, wearing area/ Plain area, dimension, abrasion resistance thickness of wearing layer etc. These are done in accordance with IS: 15658/ 2006. Cement Concrete Cube: - Testing as per IS: 516:- Compressive Strength, Density Weight etc. Bitumen (Industrial / Paving):- The parameters which are tested are water content, softening point, specific gravity, solubility in trichloroethylene/ sodium, disulphide, ductility etc. This tests are done as per as IS: 73, IS: 702. IS 694:2010 test includes High Voltage test, Insulation Resistance test, Flammability test , Tensile strength test, Annealing test , Elongation test , Hot deformation test , Heat shock test , Thermal stability test, Heat ageing test, Loss of mass test, Shrinkage test, Volume Resistivity test etc. IS 1554 (Part 1) test includes High Voltage test ,Insulation Resistance test , Flammability test , Tensile strength test, Annealing test , Elongation test , Hot deformation test , Heat shock test , Thermal stability test, Heat ageing test, Loss of mass test, Shrinkage test ,Volume Resistivity test etc. IS 7098(part 1) test includes High Voltage test ,Insulation Resistance test , Flammability test , Tensile strength test, Annealing test , Elongation test , Hot deformation test , Heat shock test , Thermal stability test, Heat ageing test, Loss of mass test, Shrinkage test, Volume Resistivity test etc. To perform testing, we use different types of testing equipment. Our testing unit comprises high-tech equipment that enhances testing process. Our equipment is procured from the trusted vendors that enable us to give the best results. 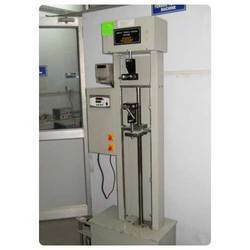 We perform test on chemical, metal and alloy, building, rubber and plastic. Water & Soil Testing Kit. Loss Angles Abrasion Test App. “National Testing Laboratory Pvt. Ltd. is conduct the tests and test reports are acclaimed round the globe as we are accredited by NABL, which works under consideration of APLAC & ILAC (which are world renowned bodies to certify the testing labs). Our esteemed clients have strong belief in us which makes us more responsible towards the stanof testing services. 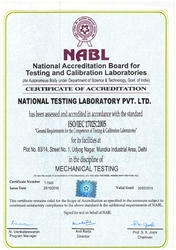 National Accreditation Board for Testing and Calibration Laboratories(NABL). In the short span of time, we have achieved a lot of appreciation from our clients due to its unique testing process. We have actualized for ourselves a prestigious standing in the Indian and the global market. Our team of professionals is talented and skilled and the cooperation of their efforts has brought us to be ahead of our competitors. The tests performed by us are done under the guidance of experts. NATIONAL TESTING LABORATORY PVT LTD Delhi started in the year 2007 and established with an objective to provide the best quality of testing services using well equipped infrastructure with the help of highly qualified technical personnel. 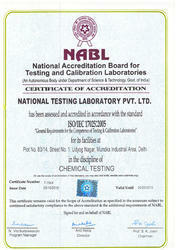 The laboratory is accredited by National Accredition board of Testing and Calibration Laborataries(NABL), Department of Science and Technology, Government of India.NABL is a Member of International Laboratory Accredation Cooperation(ILAC) and Asia Pacific LaboratoryAccredeation cooperation(APLAC) which ensures INternation Accepotability of our results.Our Laboratory is also recognized by Bureau Of Indian Standards(BIS), Ministry of Consumer Affairs, Government Of India. The mechanical and chemical division of NTL is one of the largest and most diversified in India which includes complete spectrum of specification for testing of metals, plastics, rubber, chemicals and agro chemicals, paper, leather, petroleum Products and complete building material. 1. Tensile Strength, ellongation, Yield Styress, Bending, Rebending, Shear and compression Test for all types of Bars, Strands, strips and wires. 2. Compressive strengh of Cement Mortar Cubes, Cement Concrete Cubes, Bricks and Refractory Materials. 3. Chemical and spectroscopic Analysis of Ferrous , Non ferrous metals, alloys, minerals and ores. 4. Determination of Physical and Chemical characteristics of Soil. 5. Mix designing of Cement Concrete Ratio. 6. Complete testing of coarse and fine aggregate. 7. Complete testing of Tiles , vitrified/glazed/unglazed Tiles.